Château Larrivet Haut-Brion is located 15 km from the centre of Bordeaux in the heart of the Pessac-Léognan appellation. Thanks to its acquisition in 1987 by the Andros group, the estate has finally come into its own again. Following consolidation, the area under vine is now the same as at the end of the 19th century. In light of the special nature of the soil, manager Philippe Gervoson does everything in his power to adapt his winegrowing to the terroir, using the methods applied by the region's greatest estates. The grapes are handpicked as late as possible for maximum ripeness and carefully sorted before crushing. In 1996, Philippe Gervoson decided to take another step towards quality by enlisting the help of the well-known oenologist Michel Rolland. 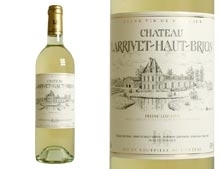 The white wine of Château Larrivet Haut-Brion is fermented and aged in new barrels. The red wine is kept on the skins for a long time in order to extract as much fruit as possible from the grapes. It is then aged in barrels, some of which are new every year.